A day after a Full Moon and things are still pretty tense. Don’t forget that yesterday we lived and survived terrible natural catastrophes all around the globe. Unfortunately that was something that we’ve predicted. Moreover, yesterday’s council of EU leaders for migration got pretty rough although the did finally reached to an agreement. Again, as we predicted, the Spirit of Earth has been awakened, for better or worse. So here we come, one day after the Strawberry Full Moon. What are the Daily Predictions for Friday, 29 June 2018? The Full Moon is still present and so are its energies. Although The cold touch of Saturn is slowly leaving the sensitive moon, it still strongly affects the Sun. Today, echoes the hard planetary transitional aspects of last day’s huge burst of energy. one last piece of information. No, things are NOT going to get more smoothly. We’ve just entered a period of Eclipses… Stay tuned! Yes your work still haunts your nights and today you may be given more responsibilities and work to do. Although you may feel you are not able to cope with these constantly increasing challenges, take few breaths and try! Who knows? This might be the chance for you to show what you’ve got! Check here what spirits advice you do today. Yesterday gave you the chance to perceive what greatness awaits for you in the future. No matter the opportunities you seemed not to be able to grasp this chance. You felt tired. Now things change. Good luck and good energy is by your side to make things right. Lost opportunity? Come on, there is no such thing. It was just bad timing! Next time, listen more carefully to the spirits. Click here to see what they can tell you today. You still seem to get stressed about what is going to happen inside your purse and pockets. Money is truly a big issue although my dear you have to understand that money is only an excuse. Try your best to heal your energy. With your chakras free from troubled and stagnated chi, you will have the chance to receive and use more energy – hence more money. More spiritual advice for you today here! It wasn’t easy, was it. I mean for starters you felt the urge to go out and shout out your emotions which were flooding your heart. But was this really different that the other day? Probably not. The Full Moon actually acts as a magnifying glass for you. Always. Try to ground your emotions and see here what spirits advice you do today. Your health still needs attention and you should try to find a way to calm down. All the signs are telling you that you need to find a better way of living. A more spiritual one. Don’t rush your life. Take few steps back and enjoy the ride. Renew your gym membership and start a healthy diet. More advice that spirits can give you here! Yesterday was interesting, challenging and exhausting. But you know, things you did last night are going to affect you for a pretty long time. This was no ordinary Full Moon for you and although it favored you, you still need time to see this happen. Flirting is still auspicious! 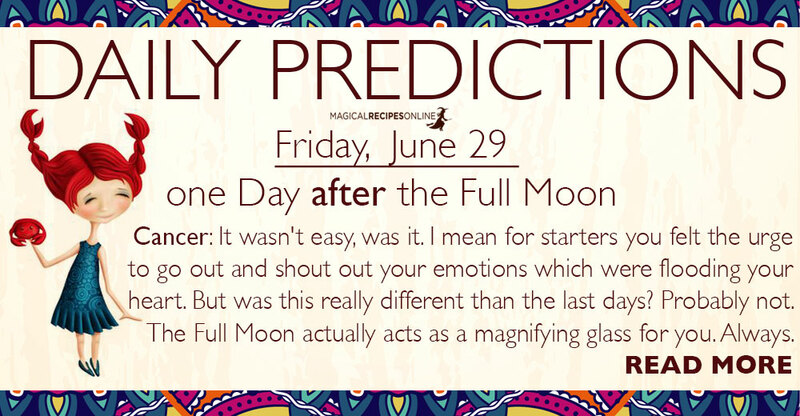 More insight for Today here – see what the spirits advice you to focus on! Ok… this was definitely NOT easy. Do you feel exhausted? You probably do. Increased responsibilities at work and not find a way to calm down at home doesn’t leave much to my imagination. But you see, that only a phase you’ve been going through. Although you do need to focus on these areas of your life you also need to find a way and blow some steam! You can also get here another advice from the Spirits. An interesting Full Moon was it, right? Take some moments and think what has happened and you will probably realize the omens were telling you that Love will survive as long as you pay more attention to these people you care the most. Friends and family is demanding but you’ve got so much love to get from them. Don’t lose hope. See here more what you should focus on, Today! You do realize that spending more money because you were ‘trying to blow some steam’ won’t help you save your troubled financial status right? You need to be more careful and dispassionately try to manage your expenses. This is a good opportunity for you to build a better and safer future to live. What do Spirits advice you to do focus on today? This was a night that you capture all attention. You were the protagonists of last night’s crazy adventures. And today, is no different believe me. However, what will you try to do with all this energy? I would advise you to focus on things you can make right. Today is the day you stand up and get things done! Here, the Spirits give you another piece of advice for Today. Your psyche seems troubled as weird emotions crawl towards your consciousness. Brain fog lifting is not an easy task. First things first. Today, when you get back home, perform a grounding technique to repel all this excessive energy you don’t need. Once you calm down, try to figure out what was all this about. If you need extra help, see here what the Spirits advise you to focus on, Today! It may seem unfair for you but your friends might truly feel neglected by you. You need to find a way and make things right. Was something you did wrong? Do you feel the need to say you’re ‘sorry’ ? Love will set you free my dear. Focus on love. If you need more insight you can check here, what do the spirits advice you to focus on, Today! Sun 29° Aries 39' 52"
Moon 07° Scorpio 09' 42"
Mercury 03° Aries 31' 09"
Venus 29° Pisces 13' 05"
Mars 13° Gemini 01' 12"